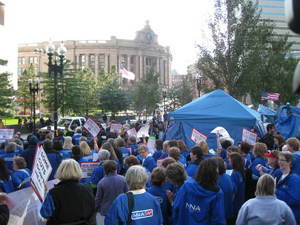 The nurses are hoping their involvement will raise awareness of the proposed “Main Street Contract for America” which pushes for increased corporate taxes to pay for social welfare programs. The contract pushes for jobs at living wages, guaranteed healthcare not based on ability to pay, being able to retire in dignity and access to quality public education. Nurses all over the nation are getting involved. This morning the president of National Nurses United was in New York while nurses also protested in Washington D.C. and San Francisco. The movement began in New York City and quickly spread nationwide to other cities. Occupy Boston is a peaceful protest in favor of the end of corporate greed and corruption. The protestors have been camping out in Boston’s Dewey Square for 6 days. They have pitched tents and don’t plan to leave until policy-makers and business leaders pay attention to their issues. Many more unions, including the Massachusetts Teachers Association, are expected to show their support in the coming days.